In a first such move by a creditor in relation to Jet Airways, US-based aircraft lessor GECAS has asked the debt-laden airline to ground at least five Boeing 737 planes due to non-payment of dues. GECAS, a top international lessor, is the aircraft leasing arm of General Electric. "GECAS has written to aviation regulator DGCA asking it to ground the planes as Jet Airways has not cleared lease rentals for five months now," said a person aware of the development. This is the first instance after the Kingfisher default that a lessor has asked a scheduled carrier to ground its planes. The development comes at a time when Jet is looking to raise fresh capital. Talks are underway with Etihad Airways, which currently owns 24 per cent stake in the airline, for equity, and with a State Bank of India-led consortium for conversion of debt to equity. 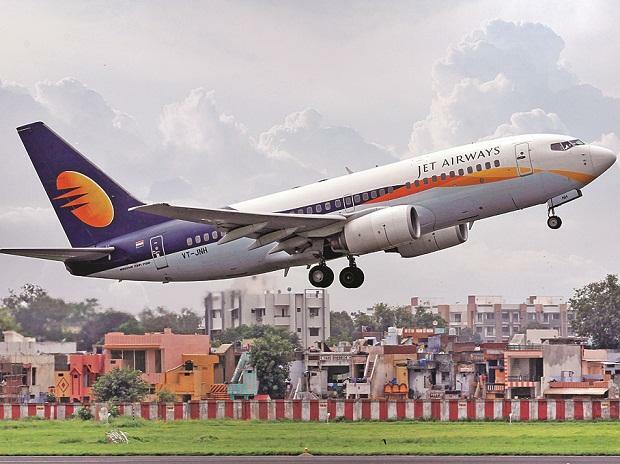 On Monday, Jet told the stock exchanges that it would seek shareholder approval on February 21 to convert the existing debt into equity and increase the authorised share capital, as part of a plan to resolve its financing problems. Enhancing authorised share capital, which the extraordinary general meeting (EGM) would take up next month, would allow the company to issue fresh shares and convert loans into equity. Queries sent to the Jet Airways spokesperson remained unanswered. A GECAS spokesperson refused to comment on the issue, citing "customer confidentiality". The grounding has forced the airline to cancel around 25 flights since Monday. The airline has already cut down its network to trim losses. Jet has 123 aircraft in its fleet that has ATR, Airbus and Boeing variants. Around 10 planes are already grounded because of want of spares and maintenance. Several of its lessors have served default notices as the airline has been unable to pay lease rents on time. It has delayed salaries and vendor payments after losing over Rs 2,500 crore in the first half of FY19. An executive of a private carrier said that default by the airline forcing a lessor to take such a drastic action would weigh heavy on the entire Indian aviation sector. "The airline should be very careful to avoid litigation against lessors. After the Kingfisher incident where lessors faced difficulty in taking back planes, they have became over cautious about India leading to higher leasing rates," the executive said. Sources in the airline also indicated that schedule has been disrupted due to pilots reporting sick due to non-payment of salary. "The airline is not sticking to its salary payment schedule. There is no mass leave but sick leave by pilots has certainly increased in the last one week," another source said. The airline had given its pilots a payment plan, according to which 75 per cent of the December salary was to be paid on January 10. "The payment hasn't come. Whatever the promoters are planning, the company needs to stick to the payment schedule," the person said. Over the past several months, the airline has struggled to pay banks, vendors and staff salaries on time. The defaults prompted ICRA to assign a 'D' rating to the airline's Rs 10,963-crore fund and non-fund based facilities. This is the seventh rating downgrade for Jet since March 2017.